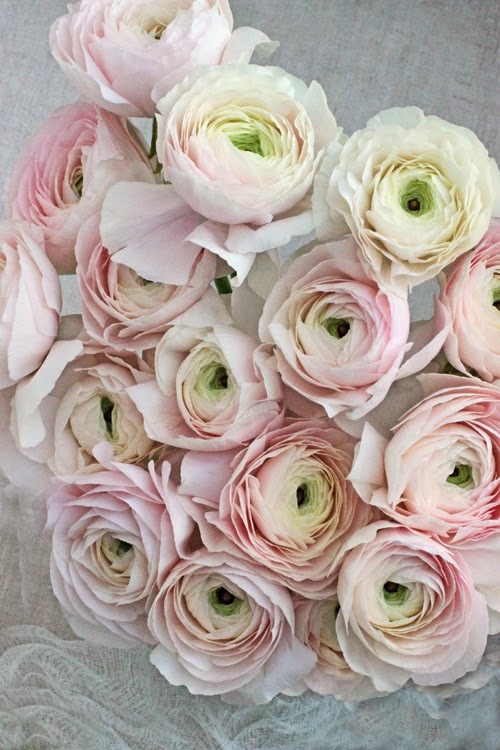 Today on 'A Bunch for the Weekend' - I'm featuring some very pretty pale pink Cloni Ranunculus from Italy - where they grow beautiful Ranunculus with very large flower heads. 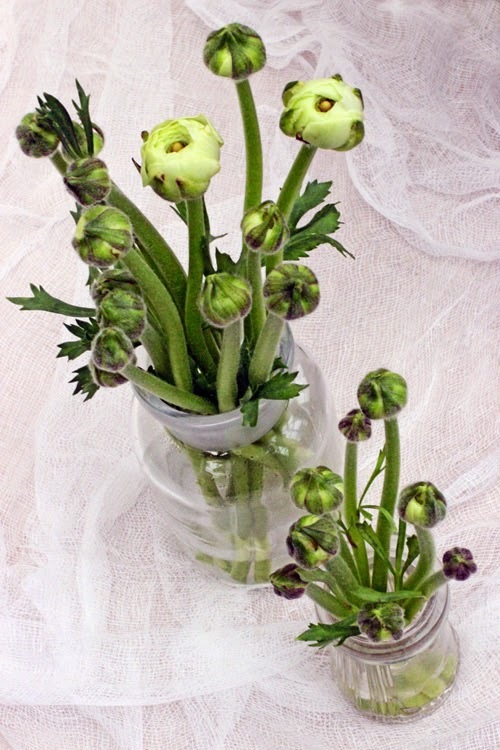 Be gentle when you are handling the flowers as Ranunculus are quite fragile - the stems are soft and the delicate, papery petals tear and bruise easily. Keep the water level in the vase low - if too much water the stems tend to rot. The flowers should last for a week or sometimes longer. If there are any small or big flower buds - keep them to make a few small arrangements on the side. 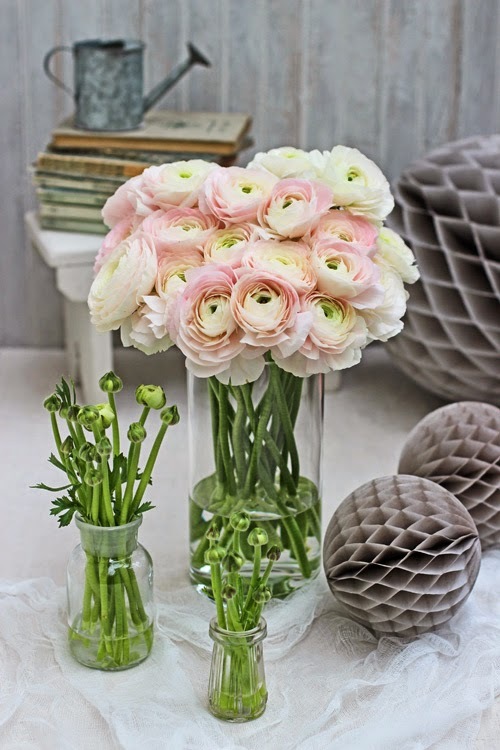 Start with some of the shorter stems and let the flower heads rest on the edge of the vase. Always measure the stems against the outside of the vase to make sure you get the right height. Continue filling the centre of the arrangement with slightly taller stems. Try to pack them as tightly as you can as you want to see as little as possible of the green stems. That way they also support each other in the vase preventing the stems from breaking. If you have saved any buds from when you conditioned the flowers - put them in a couple of small vases. They have a very different but interesting colour and texture then the flowers. I have combined the delicate, pale pink flowers with some neutral grey colours - including pompoms in two different sizes, a zinc mini watering can and some vintage books - chosen purely for the colour of the cover! For the next few months enjoy the beauty of these wonderful flowers - they are usually available until the late spring. Have a Happy Floral Saturday and Enjoy Your Weekend! Njuter varje gång jag tittar in hos dej! Underbara blommor! Det är något med ranunkler som gör att man nästan får lite yrsel. Sååå fina! Ranunculus are amongst my favorite flowers. We do not see them for sale very often here, and when they do appear, we don't always get treated to many colors. Having said all that, I must tell you how much I like these pale pink blooms that you found and arranged so beautifully. The tiny vases with the green buds are also delightful. Veldig rent og delikat arrangement! Helt underbara ranunkler Ingrid. Så vackra i färgen och så fint du arrangerat dem. Ces renoncules sont très belles ! j'adore leur couleur, so romantic ! Oh, ranunculus! they are such beautiful delicate flowers! And what a beautiful color you got there. These are those flowers to really enjoy! 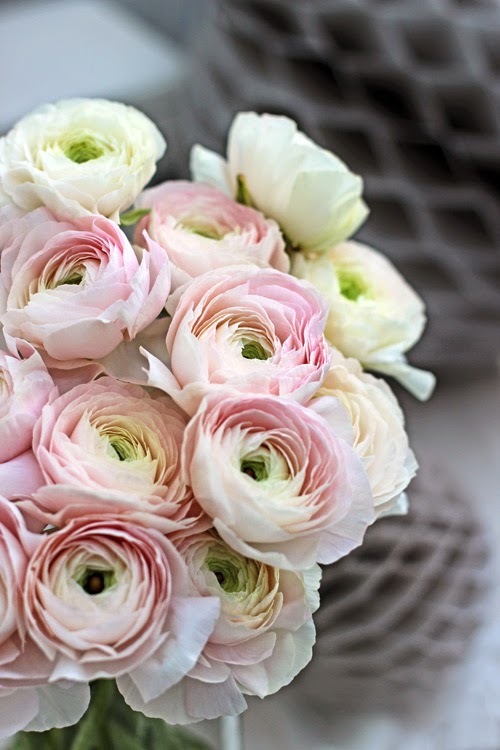 These ranunculus flowers are so beautiful! 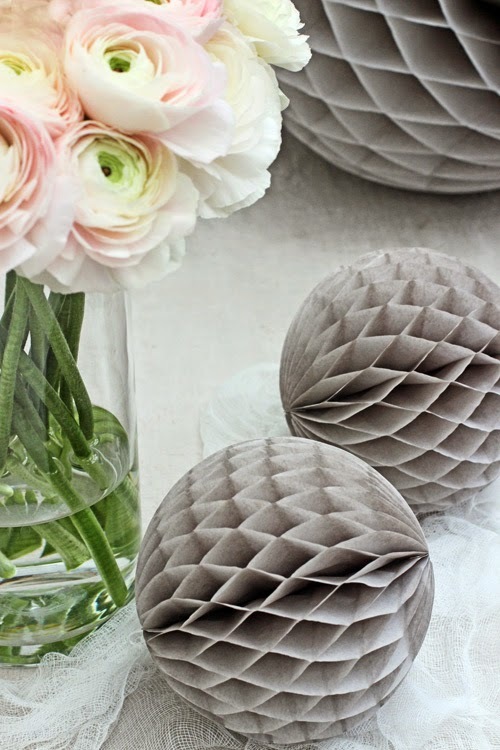 I like soft pink color combined with neutral grey accessories. Lovely styling! 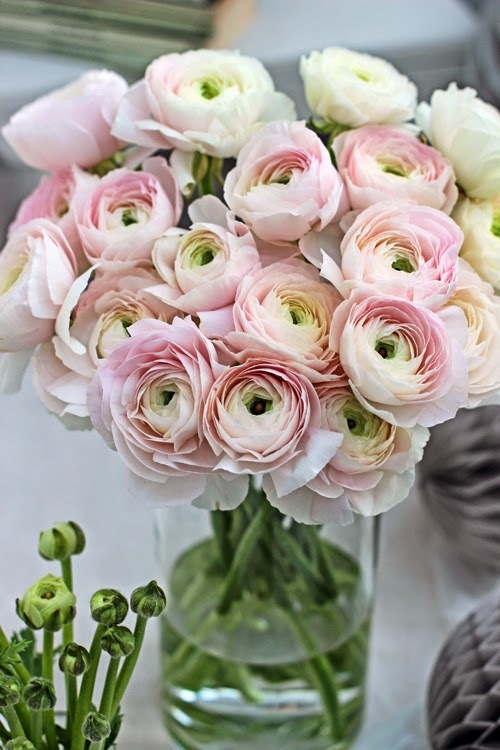 Ranunculus, lovely flowers for spring. 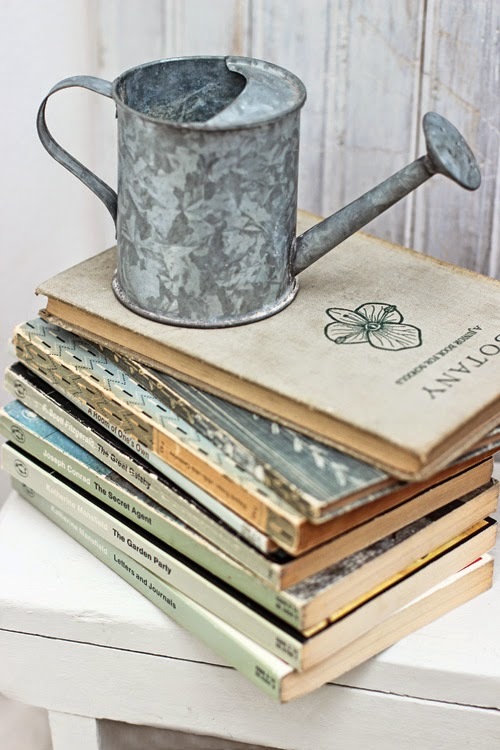 The arrangement with books and grey watering can is gorgeous. Yeah, this is just fabulous! Beautiful, Ingrid! I love it!